Stuffed Green OlivesSpanish pitted green olives stuffed with red pimiento pepper. “Shaken, not stirred” James Bond’s Martini would not be the same without our quality pimiento-stuffed olives. Not just a martini olive. Toss it into a salad, serve it as a snack, use it on your pizza… possibilities are endless! Non-GMO, Gluten free, Cholesterol free, Trans Fat free, Vegan and Kosher. Great source of Polyphenols, a powerful health-protective Antioxidant. 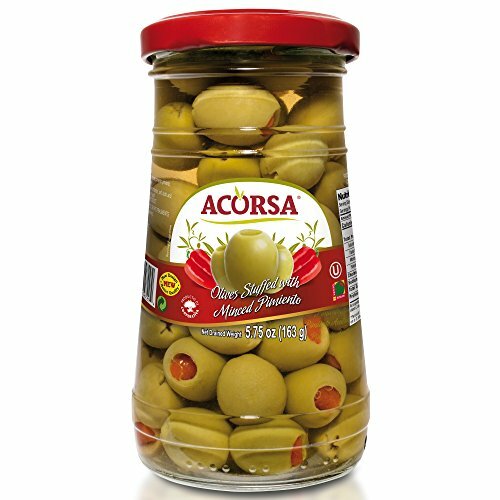 All ACORSA olives are carefully selected and follow the highest quality standards. ACORSA is part of DCOOP Group, the world’s largest olive and olive oil producer.